The congress in Solun brought a decision for starting an uprising in the spring of the year 1903. Only the date and the place of the start was missing. Due to this, a congress was held in the Bitola - Demir Hisar district. In the period of 2-7 of May, 1903 in the village of Smilevo, the congress was held. 29 delegates were invited, and discussion was opened by the question for an uprising in Macedonia. 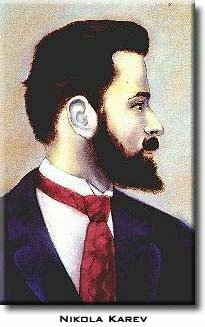 Beside the fact that some of the delegates like, Gjorgi Sugarev, Nikola Rusinski, Nikola Karev, were against the start of an uprising claiming that the organization is not in the final stage, yet. But the decision of the president, Dame Gruev who had the final words. He was for an uprising. It was decided, the uprising to start at the Bitola district. They decided the uprising to start at the Bitola municipality. A decision was brought, they created a council with three members leaded by Dame Gruev. After the short prepares in the region of Bitola such as, collecting food, weapons, munitions, medicines. A lot of preparations were made. The date was decided, on the St. Ilija (Elijah's) day, on 2nd August. The organizers of the uprising sent an official letter to Europe, that an uprising will start in Macedonia and the reasons for it. A letter was sent also to the chief of the Salonica railway, that during the uprising the trains will be bombed (in order not to kill innocent people). 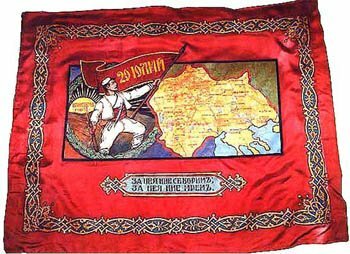 On August 2nd year 1903, started the Ilinden uprising. In Macedonia the Ilinden uprising had most success in the district of Bitola, where it started. After several successful battles the village Smilevo and the city Krusevo (later the became center of the uprising) were liberated. The start had great success in the districts of Lerin and Kostur (Aegean Macedonia, Greece). 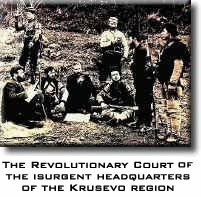 On August 4th 1903, a group of 600 uprisers liberated the city of Klisura (Aegean Macedonia, Greece). On August 17th, the united 700 uprisers liberated the city of Neveska (Aegean Macedonia, Greece). Very soon, the number of liberated villages was growing fast. A lot of villages in the districts of Kostur, Lerin and Prespa were liberated and a Macedonian authority was established. The greatest battle happened at the villages of Ezerec between 300 uprisers and 2000 Turks. The Ilinden uprisers had a great success also in the Ohrid district. The greatest battles in the Ohrid district were at the villages of Malesia and Gorna and Dolna Debarca. Big battles occured also in Prespa. The Ilinden uprisers made also success in the regions of Kicevo and Demir Hisar. In this districts, the greatest hits between the uprisers and the Turks were at the villages of Priblici, Karabunica and Izvor, and Ilinden uprisers even tried to liberate Kicevo. Ilinden uprising activities were also in the region of Skopje, Solun (Salonica), Serez and Odrin (Edirne, Turkey). The actions in the district of Serez, were leaded Jane Sandanski. Battles were carrying on all over Macedonia, and more than 30,000 uprisers, were in the mountains & armed. "Map of the Ottoman province Macedonia and Ilinden uprising in 1903"
"The Flag of the Ilinden Uprising & the Krusevo Republic"
The success of the Ilinden uprising and the 10 days Krusevo Republic has a important great value for the Macedonian people, especially the liberation of Bitola, Krusevo, Klisura, Lerin, Kostur and others. Again the uprising was active all over the territory of Macedonia. 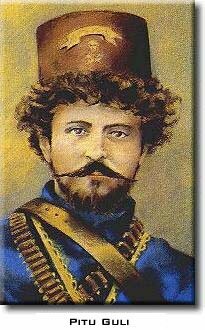 But Macedonia was important Ottoman province and they hired a lot of soldiers to put the end of the uprising. The first battle was in the region of Smilevo and Gjavato, where a great battles were done. After a couple of days hard battles on both sides and after loosing of the region of Smilevo the Macedonians got back in Krusevo. The Turks arrived around Krusevo from all its neighboring cities, like Bitola, Prilep, Kicevo. 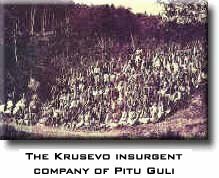 On August 12th the town of Krusevo was surrounded by the Ottoman forces. The uprisers settled in the town decided to give their live for independence of Macedonia. After the great ten-hour battles, at Meckin Kamen, Sliva... the forces of the duke Pitu Guli were heroic defeated. At the end Krusevo was bombed, robbed and burned. Part of Krusevo population escaped. In the period of August and September 1903, a lot of great battles were made between the Macedonian uprisers and the Ottoman forces in the regions of Kostur, Lerin, Prilep, Prespa, Ohrid and Kicevo. A lot of villages (houses school and churches) were burned down. Plenty of the population kids and women were burned together with the houses. 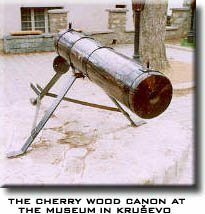 Due of all this on October 2nd 1903, the main council of the uprising, decided the to stop activities of the uprising and the weapons to be placed in secret warehouse and to keep in order to use for other liberation activities.